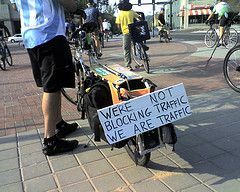 Critical Mass returned to Durham this past week with 80+ riders cycling a comfortable route through the downtown area. I was impressed with the turnout after reading that expectations were for there to be about 50 riders. And I was impressed with the range of cyclists. There were four of us that I saw (probably more) who are regularly out commuting on the Tobacco Trail each day, folks in cycling jerseys, folks in business clothes, and folks "dressed up" for the event. The bikes included stereotypical road bikes, restored beaters, pedicabs, mountain and comfort bikes, and Phillip had his Xtracycle. There were multi-gear, singles and fixies. All said, the event was great. It was fun to ride through town with a group like this that is out to advocate cycling as transportation. Most of the group rides I've been on recently have been training for a charity ride, and the timbre is entirely different. The police rode with us. That's not unexpected, as CM's in other parts of the country have experienced instances of ummm... less-than-desirable behavior. But, the nature of their participation was a little odd. They actually rode into intersections and stopped traffic for us. While that is a nice gesture, it did seem to dilute the value of the ride. Critical Mass is about asserting cyclists rights to the road - same rights, same responsibilities. Ellen pointed out that stopping traffic for us gave the ride a parade-like atmosphere. A few suggestions for future months... a) stop at all signs and signals, even if the police halt crossing traffic and b) "Critical Virus" - meet at Major and, instead of following a single route, everyone disperse in groups of two or three to a particular part of town and return to Major an hour later. Also, I hope there is a different route month after month. It was a great ride, though, thanks to Phillip, Alison, Dave and anyone else involved in putting it together.